The first time I tried eyelash extensions was on my wedding day. I remember that I tried to put some mascara on to give a more dramatic look but I didn’t know that I had to wear a water based mascara in order to avoid fallouts and extensions damage. Luckily, I did not have any accidents on my wedding day and everything went well but after a while the mascara I used made my eyelashes come off. The truth is, that eyelash extensions do not need any extra mascara on them in order to look great. But for those who have the need to use a mascara on for a “fuller” effect, water based mascara is the only way to do it. You should also avoid using any oil-based product like eyeliners or even oil based makeup remover because eventually this will destroy your eyelash extension and they will not last long as they should. (usually eyelash extensions last about 6 weeks). 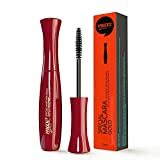 Secret Weapon Supreme mascara comes from Mirenesse, an Australian makeup company that has a lot of award-winning products. This is a brand I just recently discovered and I am excited with some of their products. 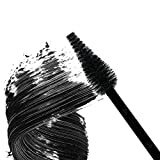 Their mascara comes with a very nice innovative brush (“Bewitching Brush”). It gives thick and beautiful eyelashes and can easily be removed just using some water. It is also very safe for sensitive eyes and is also recommended by some users who have allergies. The only downside is that the volume may not be so massive like other max-volume mascaras who are oil-based. Totally recommended to use not only for your eyelash extensions , but also as your usual mascara. A water based mascara specifically designed for eyelash extensions looks like a perfect fit to get the job done. It does a great job on eyelash extensions boosting their volume and the appearance. It stays on, does not run and is a safe choice for your lashes. One downside is that some users are complaining about the difficulty of washing-off the mascara just using water. If you find any difficulties, use a water based makeup remover to remove it safely from your eyelash extensions. Covergirl is a company that has some products I love and some products I hate. So I have mixed feelings towards them. Well, for me this mascara falls in the first category. It is a quality water based mascara that is hypoallergenic and ophthalmologically tested, ideal for people with sensitive eyes. They use a special formula (musse formula) that uses beeswax and tapioca instead of some synthetic polymers and this results to make it 20% lighter than usual mascaras. It gets removed very easily with water and some soap or a makeup wipe. It comes in a great price and has a very nice brush. Well done Covergirl! Use it for your eyelash extensions or for your everyday mascara. Another specially formulated mascara for eyelash extensions, DV Glowing Mascara is a new water based mascara that is oil-free and botanic based. It applies easy and smooth, does not clump and has a good price. Its’ strongest feature is that it give more volume and length than any other water based mascaras in the market. It makes your eyelash extensions look longer and fuller. The only downside is that it dries very fast, so you have to be careful during application. This little hidden gem comes from Mexico and I could safely say it is the best water based mascara in this price range. It gives very good length and volume to your lashes without weighting them down. You can remove it very easily with just some water and a cloth and even the smell of the formula is great. The only disadvantage I could find is the small size of the brush. This water based mascara is great and totally recommended ! Cheap and effective, Great Lash Mascara from Maybelline is almost an industry standard. It may not be specially designed for eyelash extensions like Max 2 mascara, but it can do a very good job on them. But like almost every other cheap product, it has a lot downsides: First of all, you cannot remove it only with water but you have to use a water based makeup remover of your choice. Also, avoid it if you have allergies. There is a lot of feedback from people who had allergic reactions from the use of this mascara. Overall, a choice if you are looking something cheap just to get the job done. At this price range, I would personally prefer Apple Super Lash Mascara.